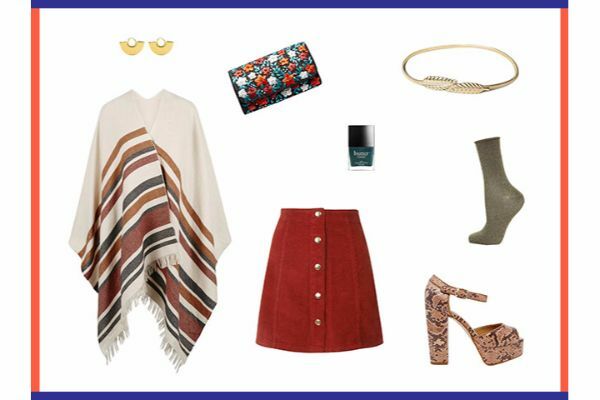 In today's post I will show you 3 top combination with poncho. Although they are sweaters obligatory piece clothing which every woman should have in your closet, there was a turn in even more modern pieces, it's a poncho. Perfect for every occasion, poncho can be part of any clothing combination because of his unique cut can be combined with anything. Today I will show you the top 3 combination with which you can wear a poncho, but also you can adjust to your style or change them one another. 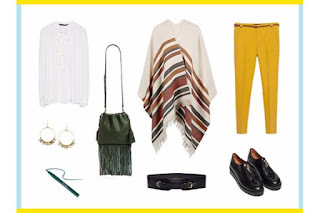 When it comes to a combination of poncho in a relaxed version most suits him the trend of the 70's. Since this combination should be as relaxed as possible, for to walk around town or going to bars, below poncho wear wear a short t-shirt or long sleeves,in a simple color which will highlight you to the body line, on the other hand-poncho will be able easy and straight to fall. As far as shoes are concerned, every choice from short boots to short sneakers is great. Optionally you can add an accessory as well like a purse bright colors and sunglasses. You will look perfect. Unlike the first one relaxed variants this combination must be more harmonious and elegant because it's a combination of work. For this combination put on poncho with your pants straight or through narrow trouser or with a skirt to the knee get dressed up shirt or a simple blouse. With poncho would It's best to put a belt on or girdle shallow, light-colored shoes as well as stiletto shoes with a small one heel represent the right choice for this combination.From the accessory wear a black simple purse that will round up the overall style. The last combination refers to night out, which means that the turn chic combination. Because the skirts are from this velor this year in the trend, wear it with a poncho.You do not need anything below because it's a poncho the most important garment piece.Because it's a night out mandatory high heels, striking jewelry, and of course the strap or belt in the golden color around the waist.A small letter purse is an excellent choice, or you can opt for another one, it is only important to be smaller in size. And that would be all for today's post, I hope you like it if you comment and don't forget to join my blog. Bye. Amazing post, dear Belma! Really nice and interesting theme for post, reall great idea! I really love poncho, and I like to wear it. Great combinations! Very nice post, dear! I like your selections! Very interestin idea for writing! Thank you for your comment! I'm following you now (#63). Please follow back! I follow u, you have amazing blog. Like it. I am your new follower #66, hope you follow me back. I am now following you on Google Plus and GFC and you're invited to follow me too. and hope you follow back - your blog is very nice. Bem lindos esses looks com poncho gostei de todos. I am following you on G+ would you follow me back now? the poncho is so amazing! love your proposal outfit! i follow you...follow me back? Wonderful! You can also choose a evening dresses for your party. Milk and honey is never a bad idea when in comes to skincare!